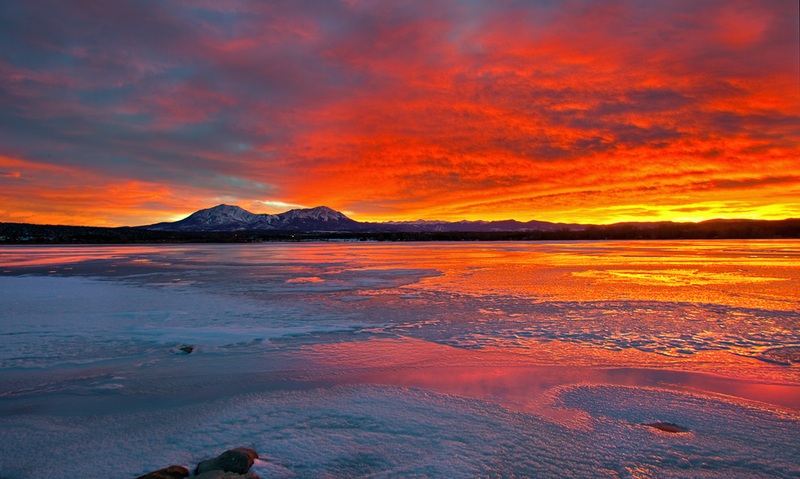 I almost missed seeing this amazing sunset from Lathrop Lakes State Park. Skies were totally grey and overcast, but a break on the horizon permitted this incredible display. I was driving back to Pueblo from the New Mexico badlands wilderness. The sky was almost completely overcast, but I noticed a thin line of blue sky on the western horizon. “Gap Light,” I thought. Gap light occurs when there is a break in the clouds on the horizon, and it creates some of the most amazing sunrises and sunsets. I pondered whether I should stop at the Great Sand Dunes NP and wait for sunset. By the time I got to the Sand Dunes, sunset was two hours away, and the sky was dismal looking, The clouds seemed to be getting thicker and no blue sky could be seen. I wasn’t anxious to wait two hours for a busted sunset, especially since that would mean a couple more hours of driving in the dark over La Veta Pass, infamous for suicidal deer and homicidal truckers. But I knew there were two other locations yet to come on my drive home, so I kept driving, figuring I could resort to ‘Plan B’ or ‘Plan C’ if conditions improved. But by the time I got to ‘Plan B’–La Veta, the sky was even more dark and dreary, so I kept going, not expecting much from ‘Plan C’–Lathrop Lakes–at this point. When I got to the State Park, I could se the frozen lake in the distance, but the dull sky was still there, and I was more anxious to drink beer and eat chicken wings back home than to wait another hour for a sunset that surely would be quite boring. I drove another five miles, into Walsenburg, and any opportunities for good sunset compositions were behind me, since the mountains run north to south and and I was about to drive to the eastern side of the range. Just as I entered town, I glanced in my rear-view mirror and caught a glimpse of a glow on the horizon. I remembered that thin strip of blue, and knew the clouds were moving from west to east. I thought to myself, “It would be an embarrassment if someone who wrote a whole book on forecasting good weather for photography were to miss a stunning sunset…” The lure of beer and chicken wings called, but I decided it wouldn’t hurt to give the sunset a shot, so I made a U-turn and headed back for the lakes. I drove into the State Park, and circled the main lake, looking for a good spot to photograph sunset. I pulled off to a fisherman’s cove, and got out to hike along the shoreline, scouting the best view. But the wind was biting cold, and there was still 45 minutes to sunset. The sky looked darker than ever, and prospects for sunset looked grim. Chicken wings and beer continued to tempt me, so I got back in my car and headed out to the park exit…the sunset was going to be a bust, I decided. Just as I exited the park, suddenly a ray of sunlight broke through on the horizon, from just a small break in the clouds. But this was enough–damn it, I could wait another 30 minutes in the cold! So, yet another U-turn, and this time I was committed. I got back to my scouted location just in time for the first color to start appearing over the twin peaks of Spanish Peaks, the thirteen-plus thousand volcanos of Wahatoya, the most prominent landmark of southeast Colorado. 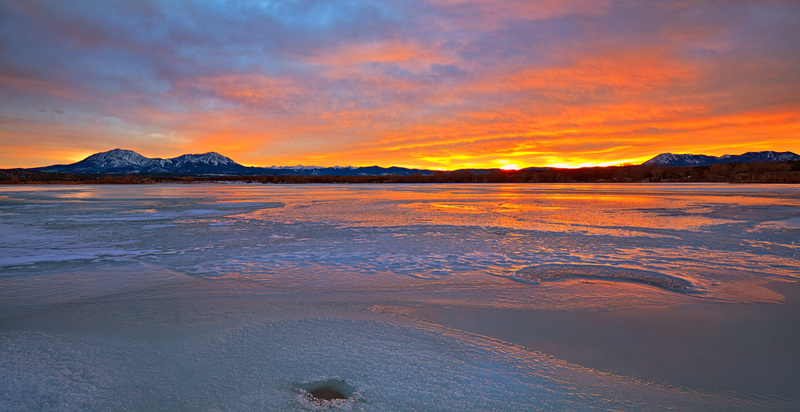 An amazing sunset unfolds from a frozen lake in Lathrop State Park. For the next twenty minutes, the sky erupted into a blazing nuclear display; one of the most incredible sunsets I have witnessed in my over ten years as a landscape photographer. I fired off a couple dozen exposures to cover four different compositions; the best three are posted here. Chicken wings and beer were now a celebration of nature’s finest. The only chore left was processing the shots, which proved to be nearly as challenging thanks to chromatic aberration and extreme dynamic range. While no photograph can truly capture the brilliant red light shining on the frozen lake, I was glad to have caught a memory of this magnificent event. 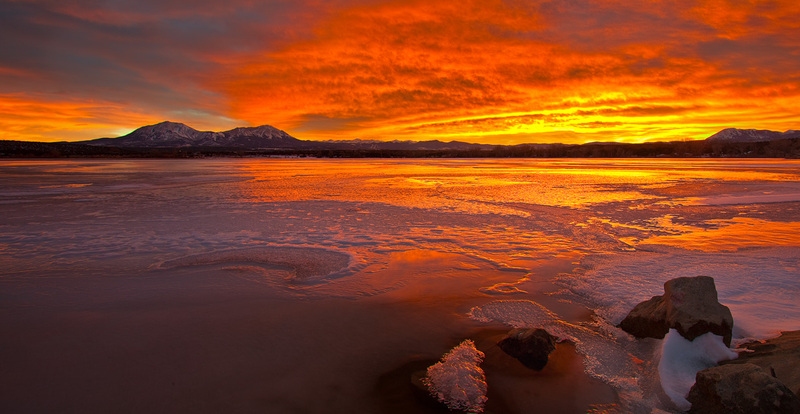 An icy lake blazes with a firey sunset. Great shots, that’s the sort of sunset I only see when I don’t have a camera with me. Glad I’m not the only one who worries about deer on 2 lane mountain roads after dark. Thanks, Patrick–yep, have had many a close call with those beasts!